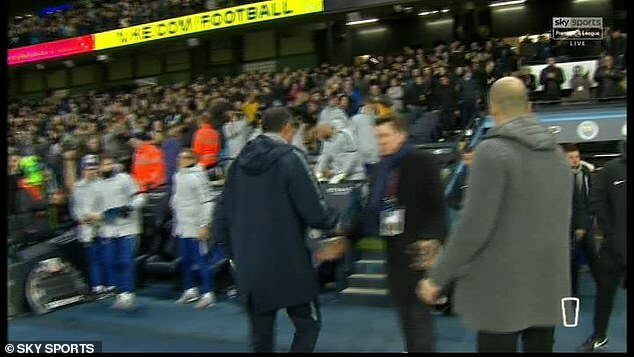 It is customary for managers to shake hands after the match but Sarri walked past the City boss and down the tunnel at full-time. 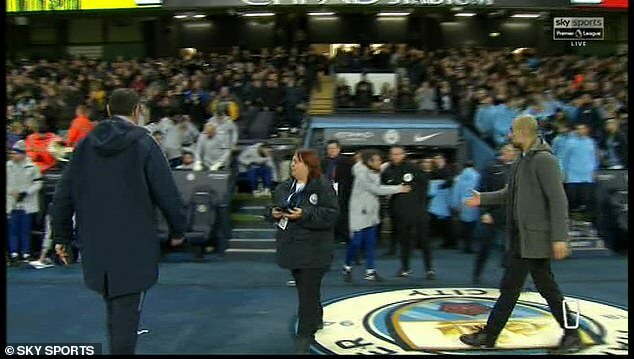 Guardiola was asked about it and he played it down after speaking to Sarri’s assistant manager Gianfranco Zola – who said Sarri did not see him. Sarri watched his side concede four goals in the first 25 minutes and Sergio Aguero, who scored a hat-trick, missed an open goal in that time. Guardiola has been very complimentary towards Sarri in the past as he hailed him before he joined Chelsea when he told Calciomercato: ‘I have no doubts that Sarri is one of the best managers out there. It is Chelsea’s worst defeat for 27 years and leaves the Blues in sixth place behind Manchester United and Arsenal. Raheem Sterling broke the deadlock at the Etihad before Aguero scored twice. Ilkay Gundogan made it four before Aguero rounded his hat-trick and Sterling added a sixth with 10 minutes to go. The Blues face Malmo in the Europa League next which could represent their best opportunity to qualify for next season’s Champions League were they to win the competition.